My maiden name is Guenther, and my dad’s side of the family has a pretty German heritage, but somehow or other I don’t think I ever tasted sauerkraut until I was an adult. Most likely my mom, who is all Irish, didn’t fancy the stuff. So it just wasn’t something I ever ate as a kid, and I must have therefore figured it was a “yucky” food, and never sought it out. Until one day I was visiting some relatives on my own after college, and they had sauerkraut as a side dish. I enjoyed it from the first tentative bite! It was like pickles, sour and salty and a bit crunchy. I started buying it at the store from then on – not religiously, but when I remembered it as a flavorful condiment. After learning more about fermented foods, recently, I have decided that homemade sauerkraut is the next project! And not only that, but I decided I first needed to make my own ceramic crock to ferment it in, being that I am a potter, after all. Now that I had a crock to ferment in, here’s the process I followed for homemade sauerkraut! I filled a huge bowl with chopped cabbage. Just one head, about 2 lbs. One head of cabbage was more volume than I expected! But then I added sea salt, probably about 3 teaspoons (I didn’t measure), and started squeezing the buhjeezus out of it. This got the cabbage all coated with the salt, and already it started drawing the water out. After walking away, and then coming back to repeat the massaging process every 10 minutes or so, the cabbage really started releasing its juices. After an hour of this, I felt the cabbage was sufficiently reduced in volume and wilted enough to start packing into the crock. I tossed in a teaspoon of caraway seeds (because Michael Pollan added some to his in Cooked), and then into the crock it went, handful by handful. I used a cocktail muddler to really pound down the cabbage. This forces out the air, packing it down, and it gets the water to continue squeezing out of the cabbage. The cabbage juice (or brine) needs to be at a level above the solid cabbage; this protects the kraut from exposure to air, which can cause it to mold (bad). Once I felt I’d pounded enough, and the cabbage was sufficiently juicy, I topped them off with two half circle ceramic weights I’d also made when I made the crock. These will keep the kraut from floating to the top and getting moldy. The bacteria that transform the cabbage in to sauerkraut prefer an oxygen-free environment, so that’s the environment I intended to create. The photo above shows my little helper Ethan, pouring the water into the reservoir around the crock lid. The water will let CO2 out (it’ll “burp” to release pressure), but won’t allow any air to go in. Look how proud he is, helping Mama. Nevermind that he spilled most of the water on the counter, haha. By the way, how is it possible that this kid is two-and-three-quarters already?? Obligatory observation on how time flies. So that’s it! Now my pretty little crock will live on the kitchen counter for a few weeks, and hopefully it will produce a yummy, probiotic sauerkraut! And out in my studio I’m working on improving my design. 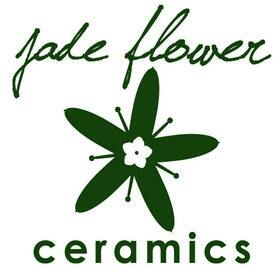 Swing over to my Jadeflower Ceramics Etsy Site – I’ll have crocks like this (better, even!) for sale in my Etsy shop. Here’s to my continuing fermentation adventure! Bye for now! Anyone who bakes regularly knows how essential good vanilla is. And how expensive the real stuff is! 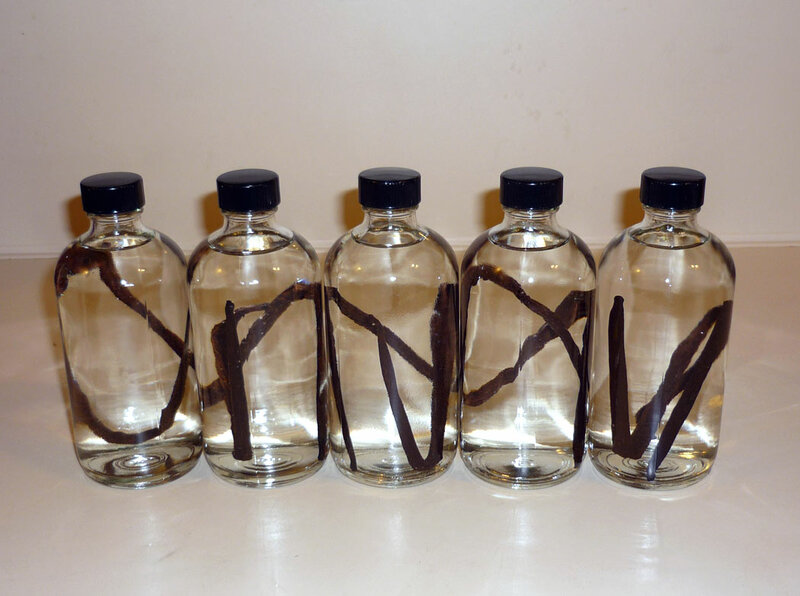 This homemade vanilla will never run out, so long as you have vodka on hand to replenish the bottle. The vanilla beans just keep infusing the alcohol! The method is very simple! Take your vanilla beans (2 per bottle) and with a sharp knife, slit them down the middle, length-wise, part way (don’t cut them entirely in two). This will allow the vanilla to infuse much quicker and easier than whole, intact beans. Insert the beans into your bottles, and fill the bottles with vodka (using a funnel makes this easier). 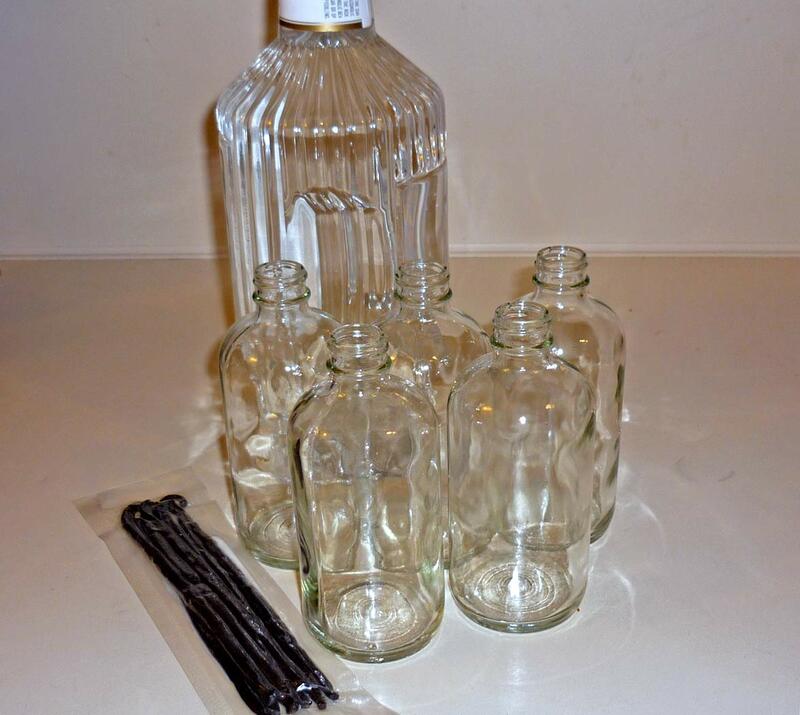 Cap the bottles tightly and store them in a cool, dark place (like a kitchen cupboard) for several weeks. Every so often, check on their progress, and give a gentle shake. Your vanilla will slowly turn light brown, and eventually, it will be a beautiful amber color, and smell like…well, vanilla! For a fun touch, add a printed label and a bow. M & I modified an awesome label designed by EatDrinkChic that originated here. 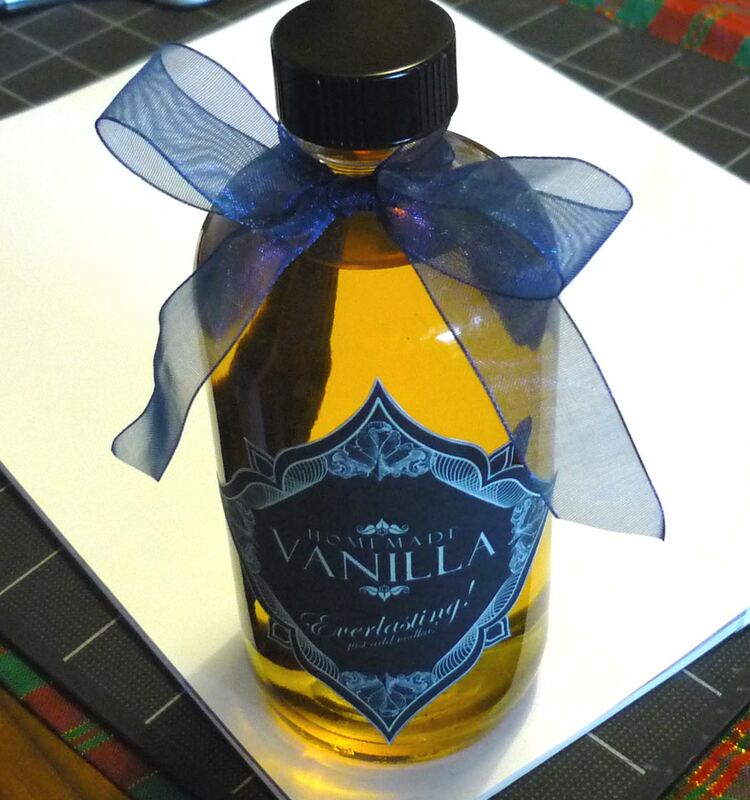 Another great vanilla label can be found here. And here’s a great resource for blank vintage labels you can customize! Above all, have fun with it. Happy crafting! I’ve been a very remiss blogger, and I do apologize! You know sometimes you just get into those ruts where you don’t think you have anything interesting to say. Well, I’m going to try to break out of that mentality! October First already! I don’t know about you, but I love the fall. Autumn is one of those seasons that I think you hate as a kid, but grow to adore as an adult. I love the crispness in the air, and the changing leaves, and all the bounty of the harvest. Thoughts turn indoors as the days get shorter. One bit of bounty that has carried over from summer is the stash of blackberries in my freezer. My dad is notorious for picking (and hoarding) loads of blackberries that grow wild all over the place out here. Last time I was visiting home, my mom told me to take some with me – I discovered at least a dozen 1-gallon bags of frozen berries in their freezer! Yes please, I’ll take some. Blackberry muffin batter adapted from Simply Recipes, and Cream Cheese Filling adapted from The Delicious Life. 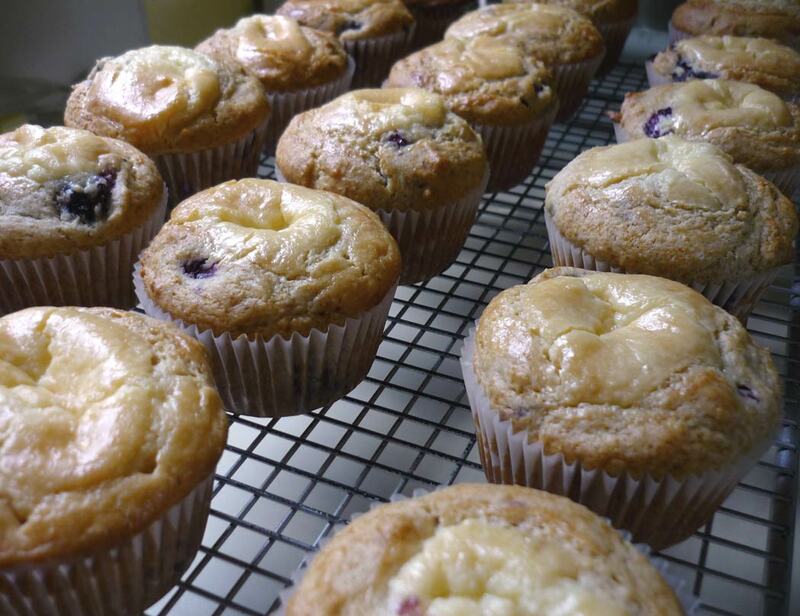 Preheat oven to 400 degrees F. Grease muffin tins, or use cupcake liners (yields about 18 muffins). In a large bowl, combine all dry ingredients. In a separate bowl, whisk eggs, sour cream, milk, agave, oil and vanilla. Add blackberries, and dry ingredients, combine with swift, broad strokes – do not over mix! 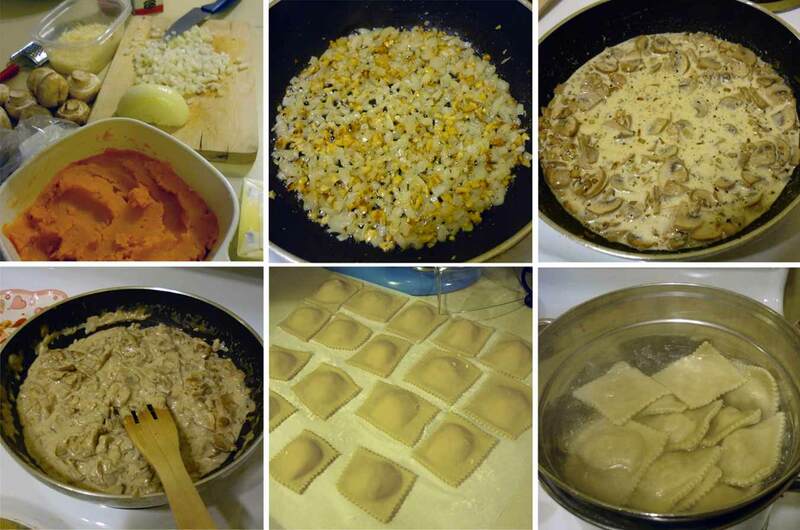 Beat together all the filling ingredients until smooth. 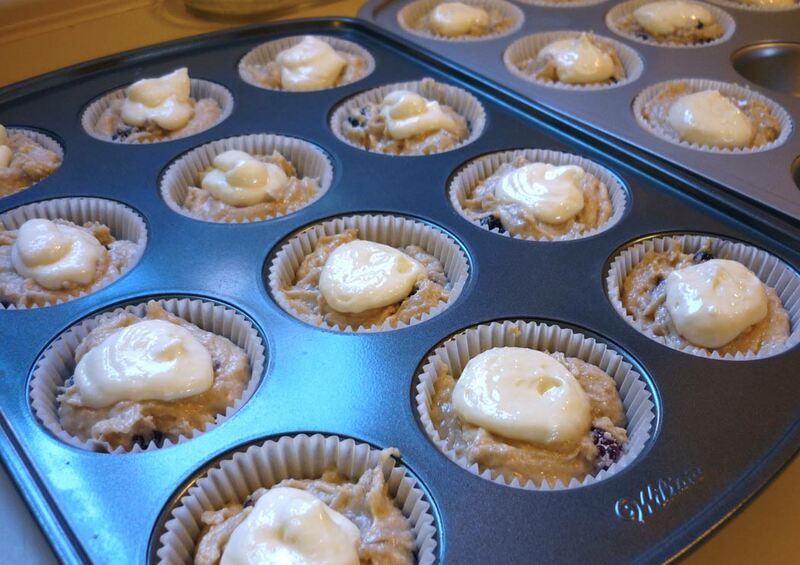 You can use a spoon to fill the muffins, or use a piping bag for more control. I filled a ziplock bag with the filling, then snipped the corner off and used it like a piping bag. Fill the center of each muffin until you run out of filling. 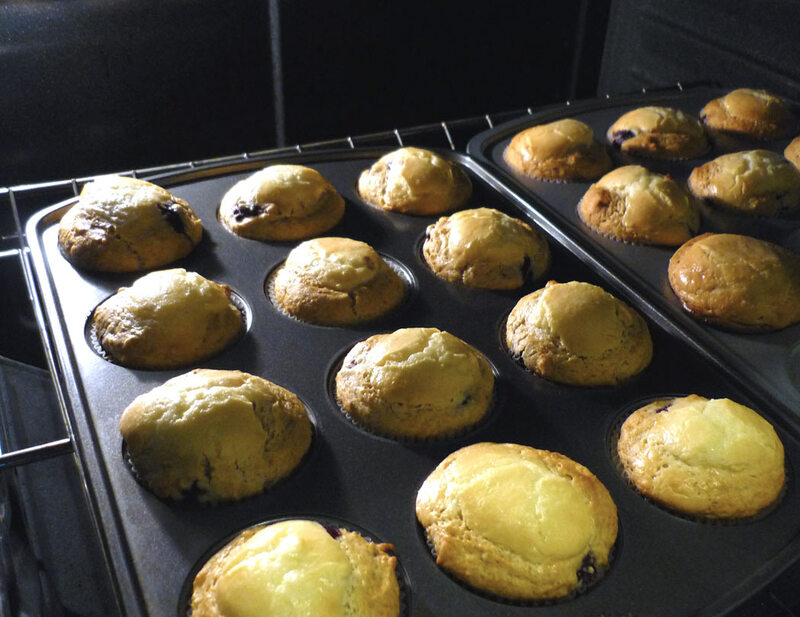 Pop the filled muffins into the oven and bake for about 20 minutes, or until starting to brown on top. Cool in the pan for 5 minutes, then transfer to cooling rack. I’m back! 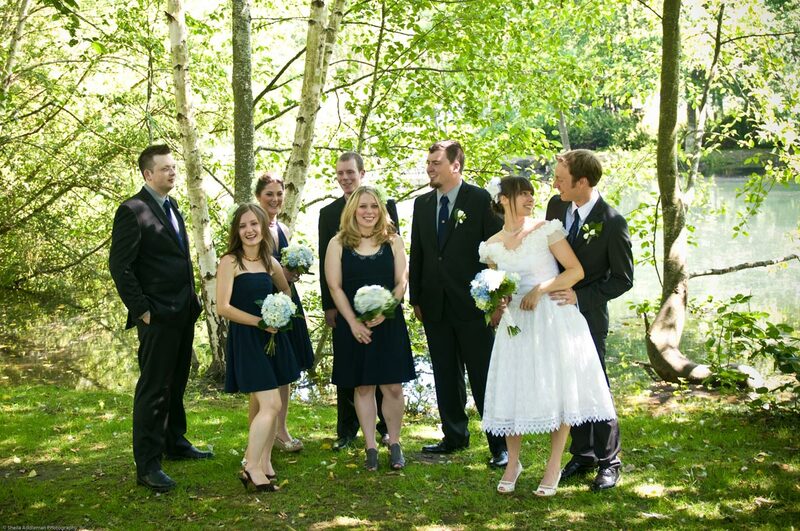 Let’s start the wedding recap! I’ve been such a remiss blogger as of late! 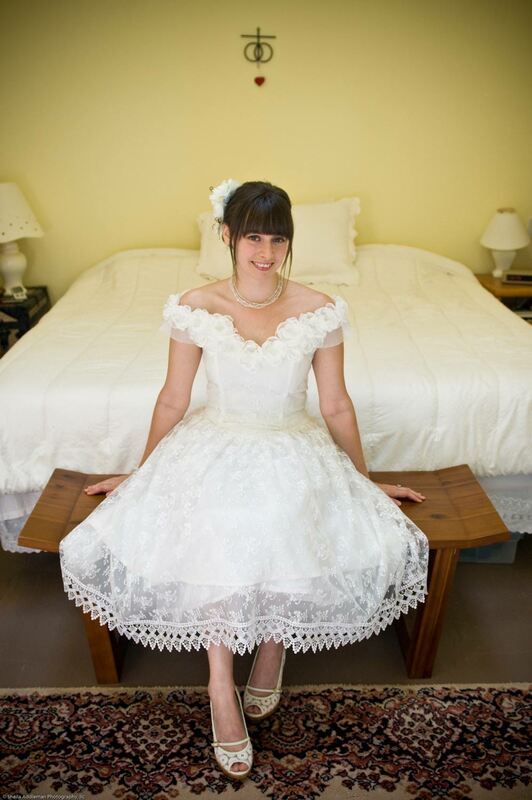 Since the wedding (one month already!) I’ve had so many things I’ve wanted to share, post-event, that it’s been too overwhelming to even begin. But last night M & I got to meet up with our awesome photographer (Sheila Addleman) and now we have all our wedding photos at our disposal on disk – it’ll be much more fun to show you wedding details using Sheila’s amazing pictures. 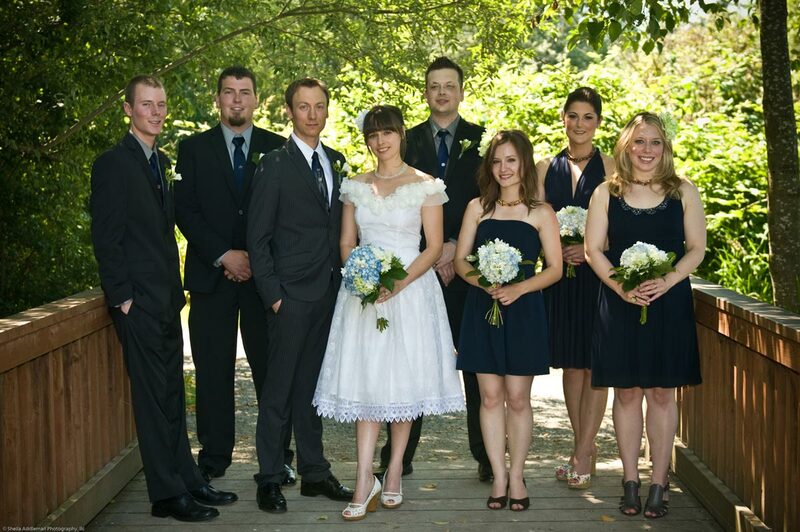 There are so many things, I guess I’ll just jump in with an overall look at the wedding day. 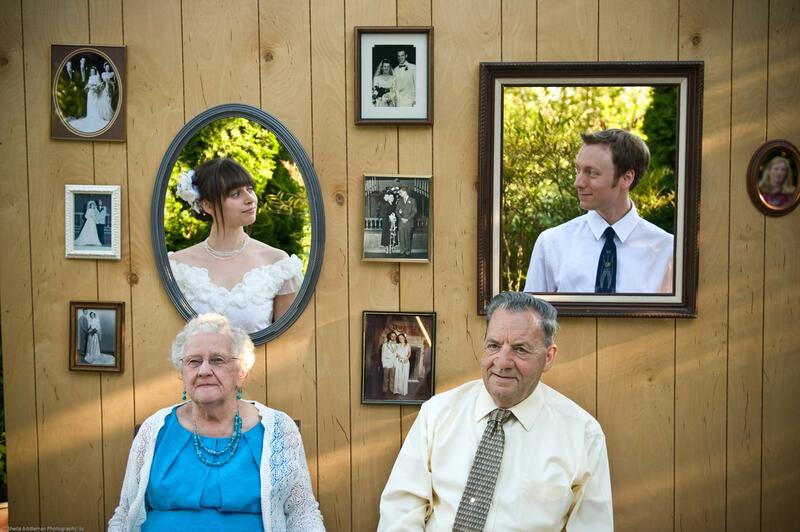 It was, in every sense of the term, a do-it-yourself wedding. 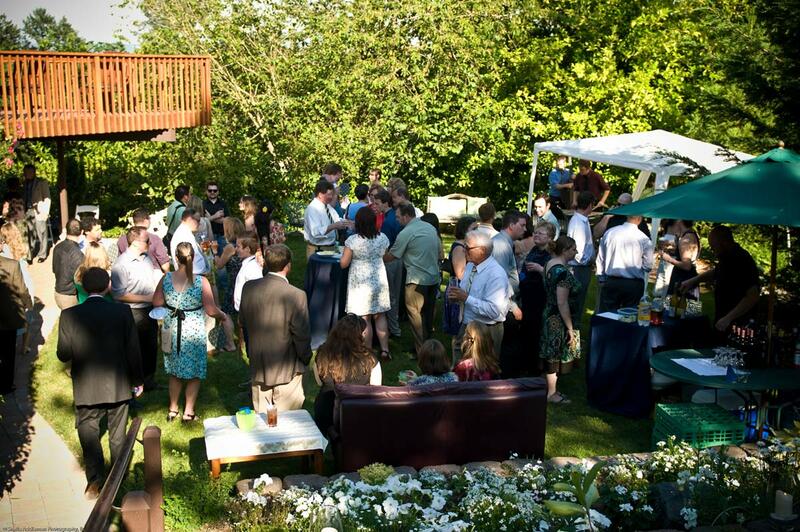 Every detail was created by M or myself, or friends and family, and the entire execution of the event was achieved by the loving effort of a whole army of people that descended upon my parents’ house the few days before (and after) the wedding day. 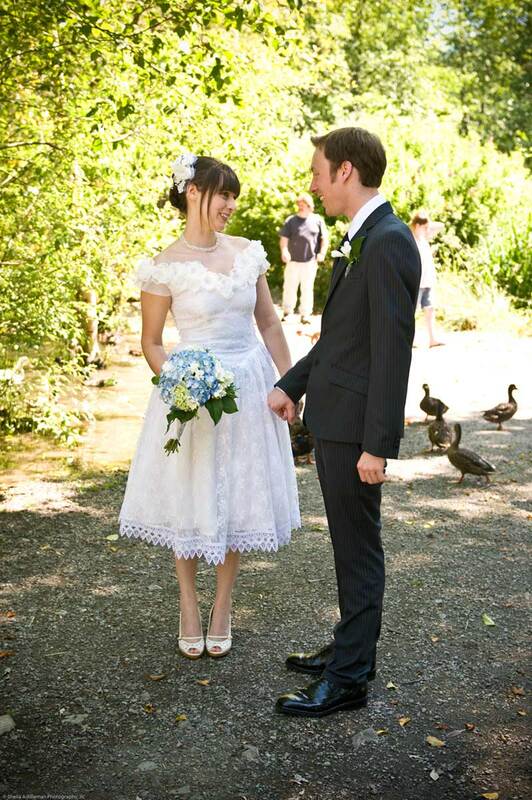 I still have an overwhelming feeling of gratitude to everyone who helped with our special day! There was really just so much love present, it was amazing! Though most of the set up had been done the day before, there were still plenty of things to do the morning of the wedding, and you could find the bride either on a ladder with a power drill, hanging up panels of fabric, placing signs down the street, giving people jobs to do, greeting people and generally running around like crazy (though not actually going crazy). 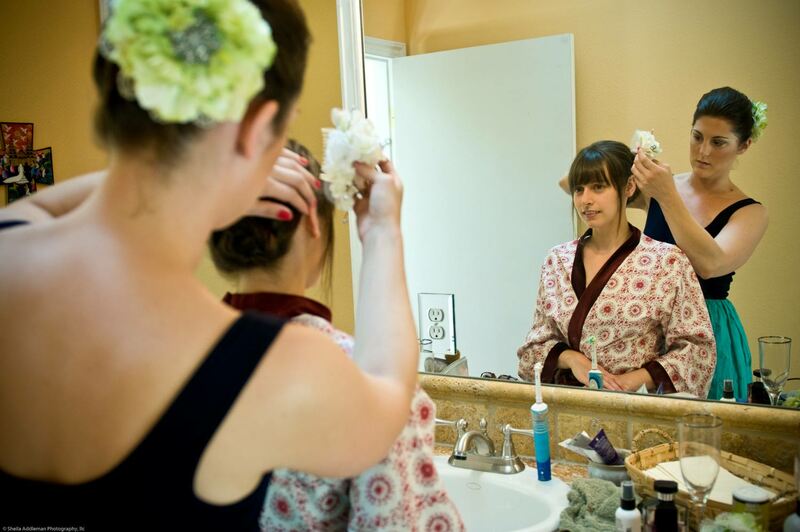 My wonderful bridesmaids arrived around 10 AM and they also helped with last-minute details. But at noon, we officially stopped helping, and went to get ready in my parents’ bedroom & master bath. Sandwiches and mimosas in hand. 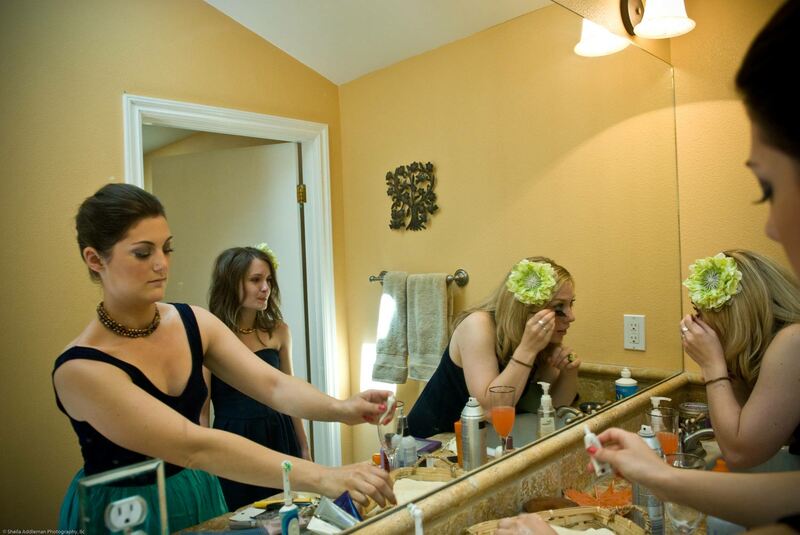 Everyone did their own hair and makeup (with help from each other). 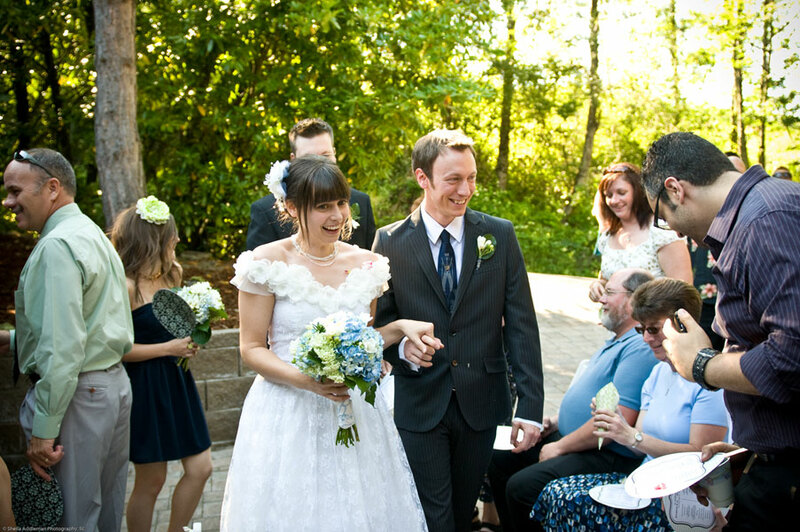 I did my own make up, and Brenna – wonderful friend, bridesmaid, and fashionista – graciously did my hair in a messy bun with little wispy sections framing my face, topping it off with my custom-made fascinator. I loved my hair! M and I did a quick “first look” and then we headed down to the local park to take the wedding party pictures. Sheila did such a wonderful job! She kept us moving and totally put us at ease. The shots she captured were on the casual side, but dreamy, which was perfect for the overall vibe of the day. 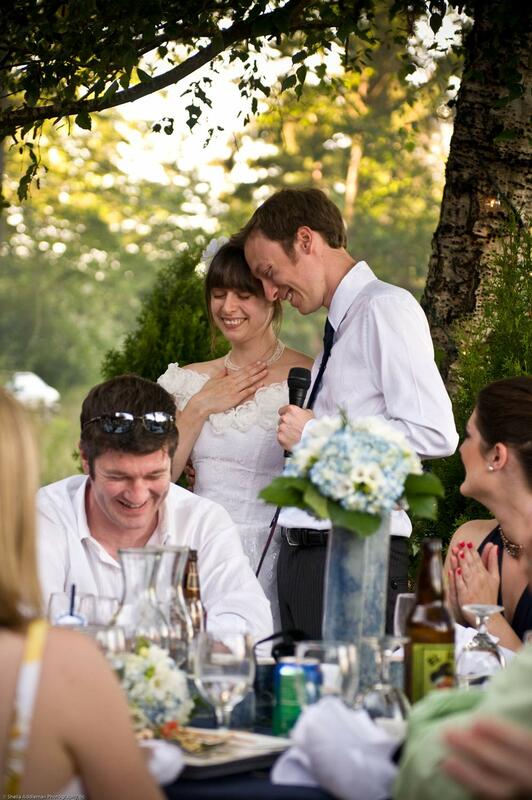 The wedding ceremony itself was perfect. 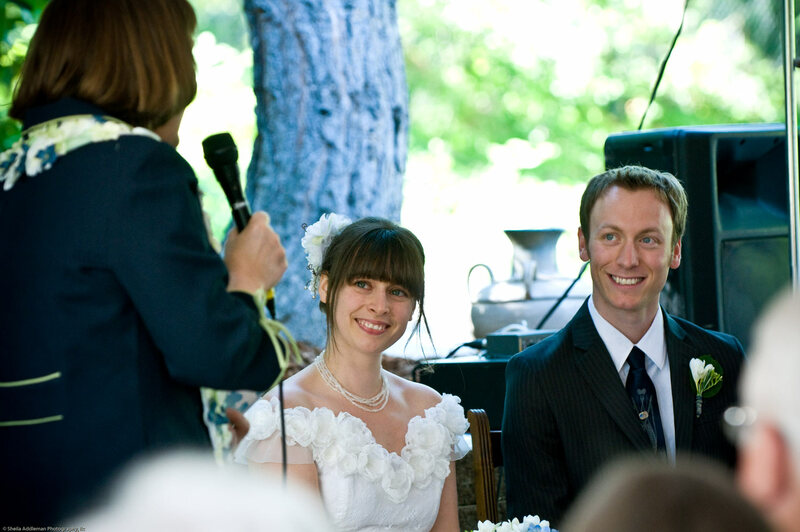 My mom officiated (which was risky I know, but she is a professional and kept it together the whole time, haha), and she used just the right balance of humor and sentimentality. I thoroughly enjoyed looking out over our gathered friends and family and seeing lots of eyes being dabbed (even the men!). After the joyous conclusion to the ceremony, we set our guests loose for cocktail hour, and entertained them with live music. 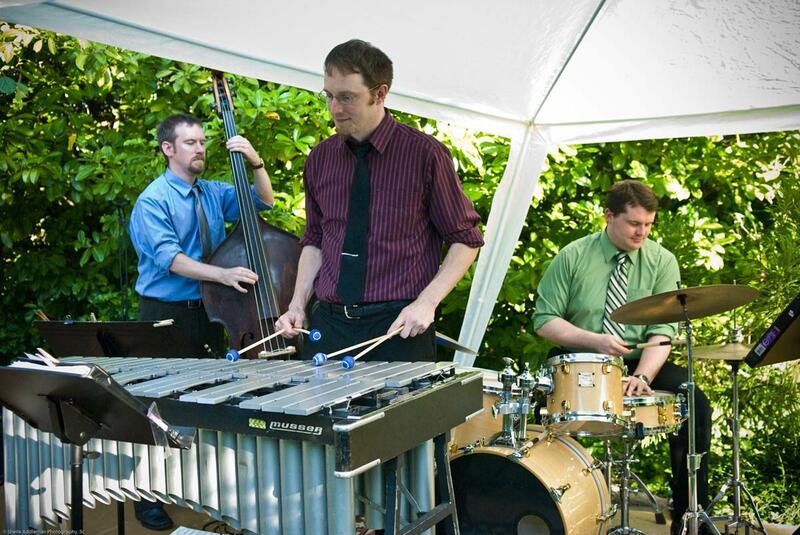 Our next door neighbor is a musician, and we knew from the start that we wanted his jazz trio to play at our wedding – vibraphone, bass & drums. They were so much fun, and everybody loved having live music! 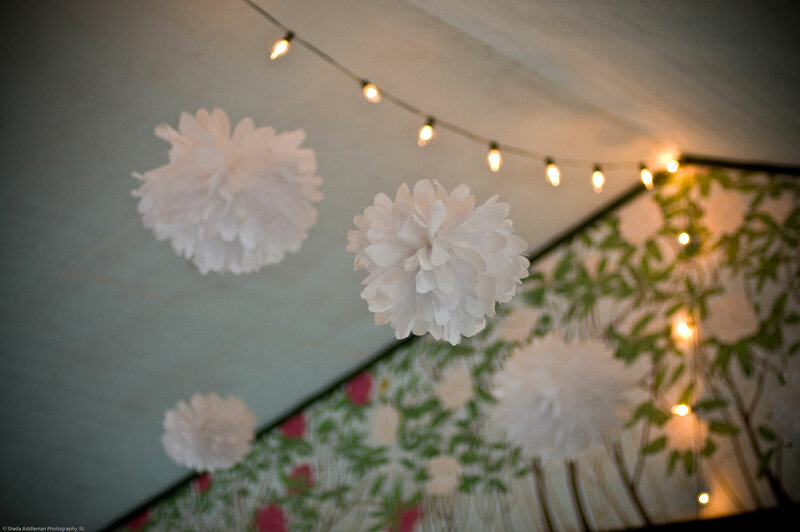 There were entertaining details strewn throughout the yard and inside the house. 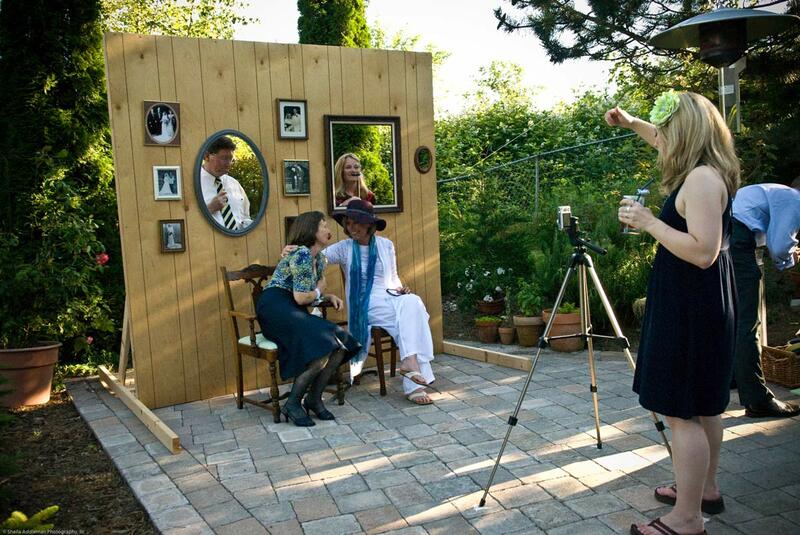 We built a photo booth wall especially for this day, and people loved it (we got so many great pictures)! 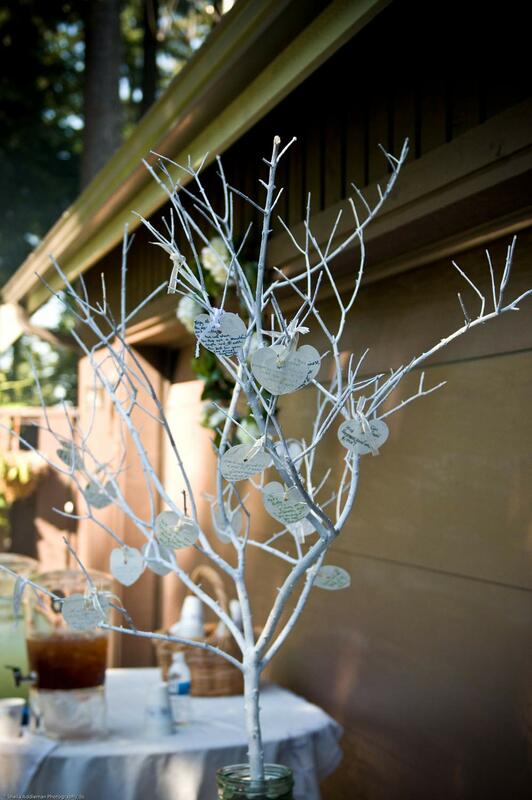 And instead of a guest book, we had a “wishing tree” for people to write notes to us on paper leaves. 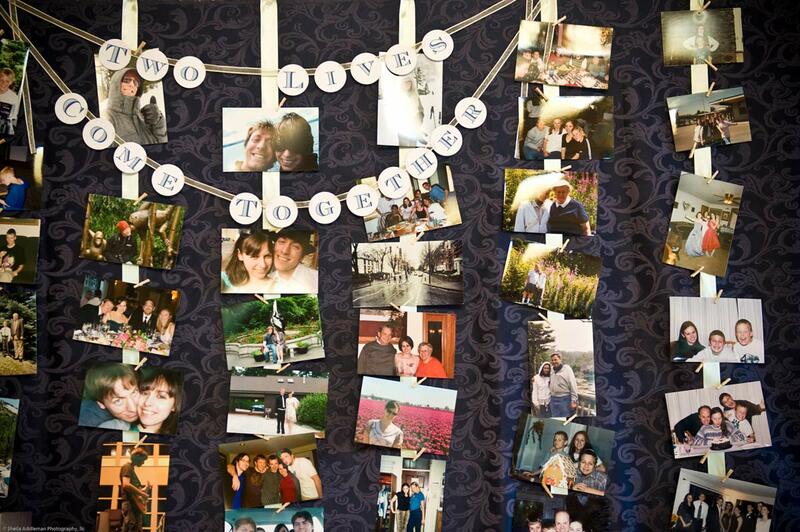 And we hung up a huge fabric panel, on which we hung ribbons clipped with over a hundred photos of M & I, from baby pictures up to just weeks before the wedding. The dinner we served was just brilliant. 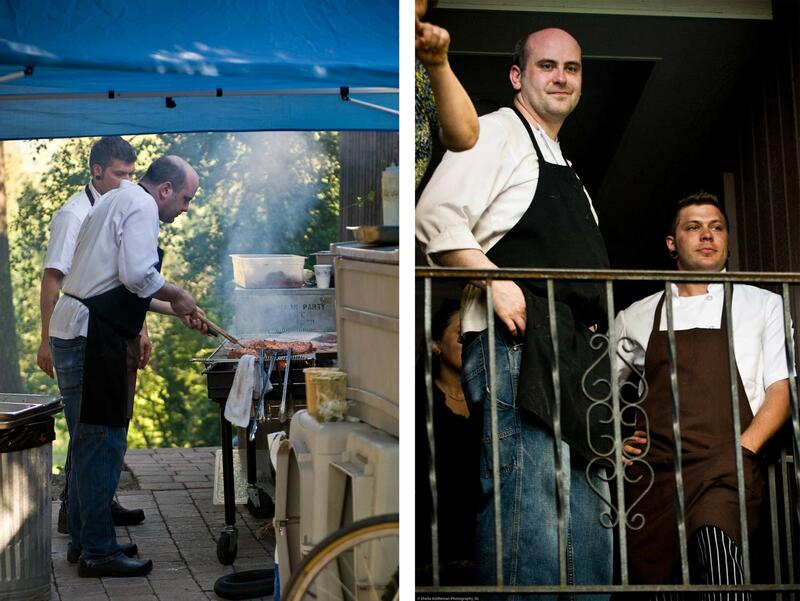 Our very talented caterer, Drew Pritchard, is a long-time friend and current housemate, of my older brother. He’s an amazing chef and skilled banquet organizer, and again, we knew from the start that we wanted him to do our food. And he didn’t disappoint! Everyone was raving about how good the food was. Lots of wonderful things were said during the toasts, and I almost lost it when I wanted to thank everyone for being there and how special and meaningful each and every one of our guests are to us. Luckily M jumped in before I totally broke down – we’re a good tag-team. 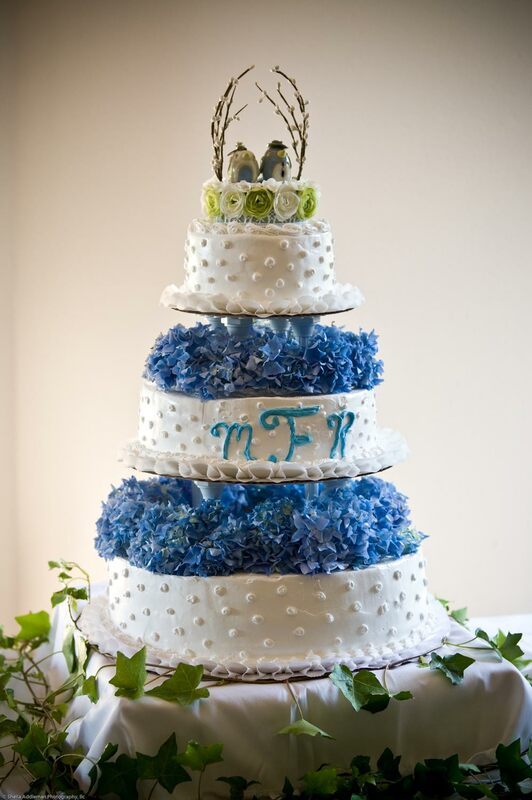 The cake was a work of art that my master-baker Uncle Bill created for us – a three tier cake (1 layer white w/ bavarian creme filling, and 2 layers of carrot cake w/ cream cheese filling) with blue hydrangea blooms between the layers, and airy whipped frosting with a simple dotted design. 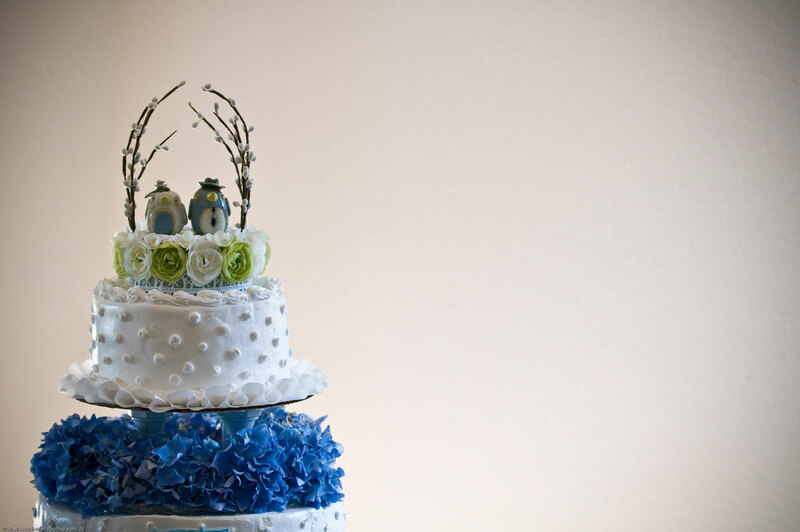 And my ceramic birdies topped the cake, of course. More to come! I’ll go more in depth on all the details soon. Let’s talk about wedding flowers. For whatever reason, despite being a self-proclaimed crafty person, I have never gotten the hang of flower arrangements. Perhaps this is just due to not receiving any guidance or instruction in the art of arranging flowers, but the fact is, if you give me a pile of beautiful individual flowers, I will most likely make them look terrible in a vase. 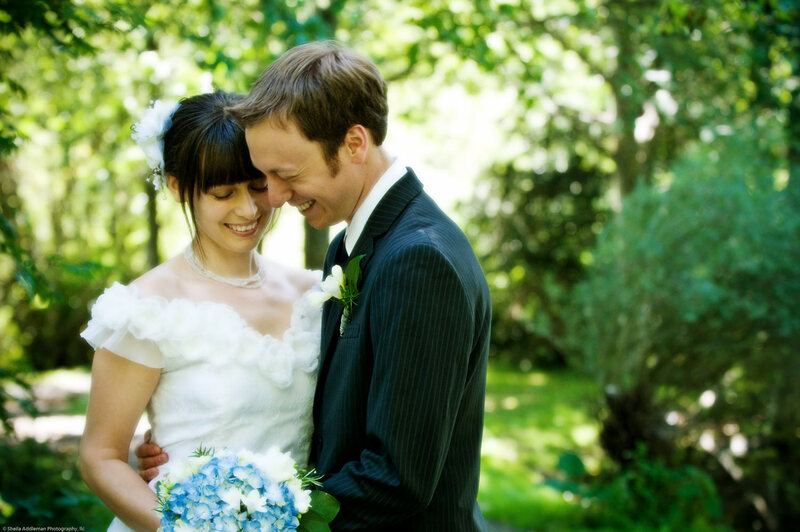 So, I was completely inspired when I read this post on Once Wed several months ago on DIY herbal boutonnieres. 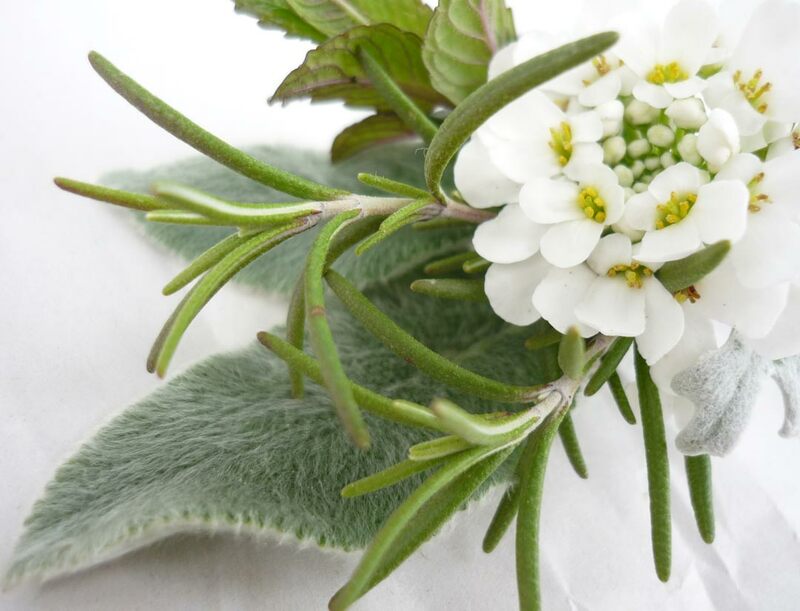 The tutorial was so simply laid-out and gave such a charming end result, it made me think that even I could craft a beautiful homemade boutonniere out of plants I have growing on my balcony! So here is my own attempt to make a green and white boutonniere from plants I already have. 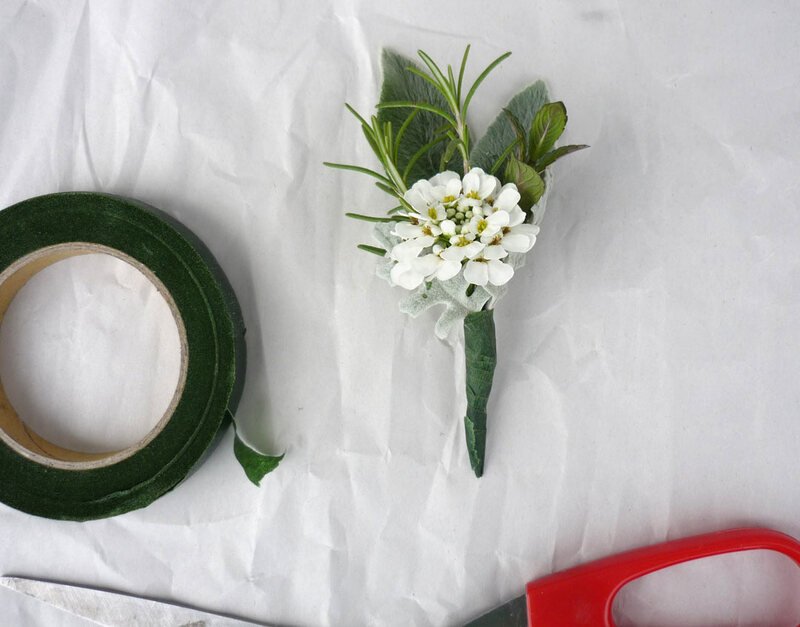 This is really only an experiment – I don’t know if I intend to make the groomsmens’ boutonnieres for the wedding day, but at least now I know that I could! I made all of the stems roughly the same length, and then began layering them. 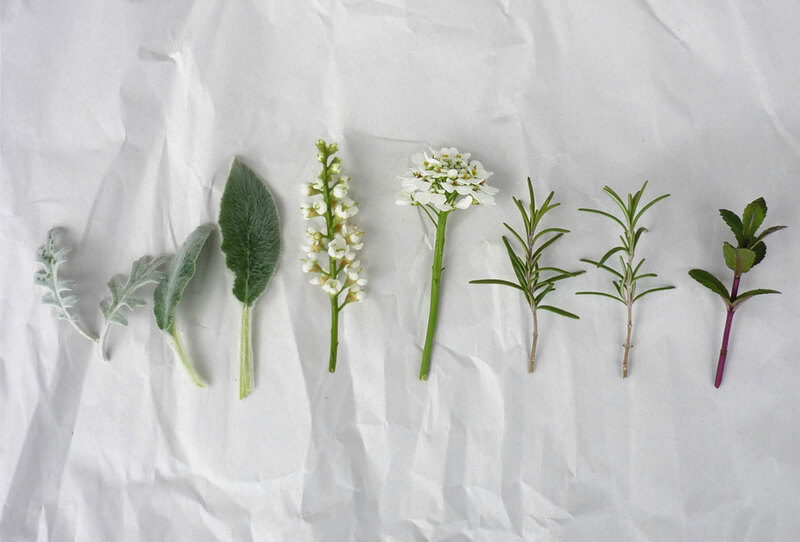 I knew the lamb’s ear should be in the back for a nice back ground, then the rosemary and mint, then the white flower-thingy in the middle, and then the Dusty Miller sprigs in front. So when M got home from work I showed him what I had whipped up, and to my delight he thought it was fantastic. He especially loved that it smelled of rosemary (he loves rosemary). And then he kept petting the lamb’s ears. Last week was filled with seeing friends, making good food, doing holiday stuff. Ahh, so fun. 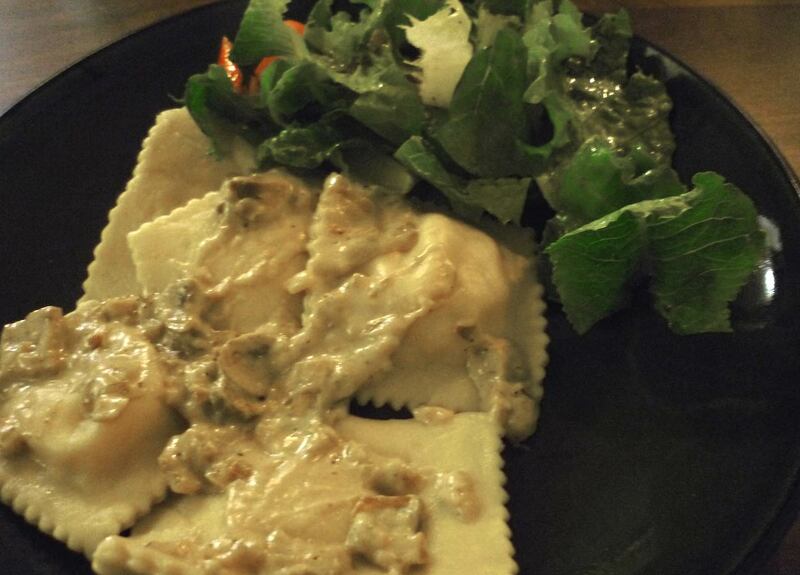 Thursday night I made butternut squash ravioli (from scratch) with a mushroom walnut cream sauce that was sooooo yummy. 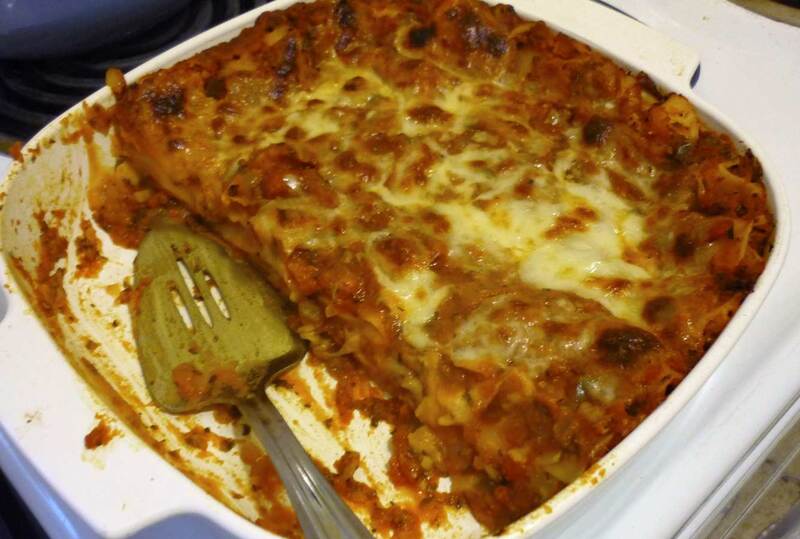 But I made far too much of the squash filling, so I had leftovers, but it was too good to just throw out, so on Saturday, I used the rest of the filling to make a delish lasagna. Layering homemade spaghetti sauce, butternut squash filling, parmesan & mozzarella cheeses, and Trader Joe’s “no bake” lasagna noodles, I cranked that thing out in no time! It’s amazing how easy things are when you have all the components on hand and ready to go. 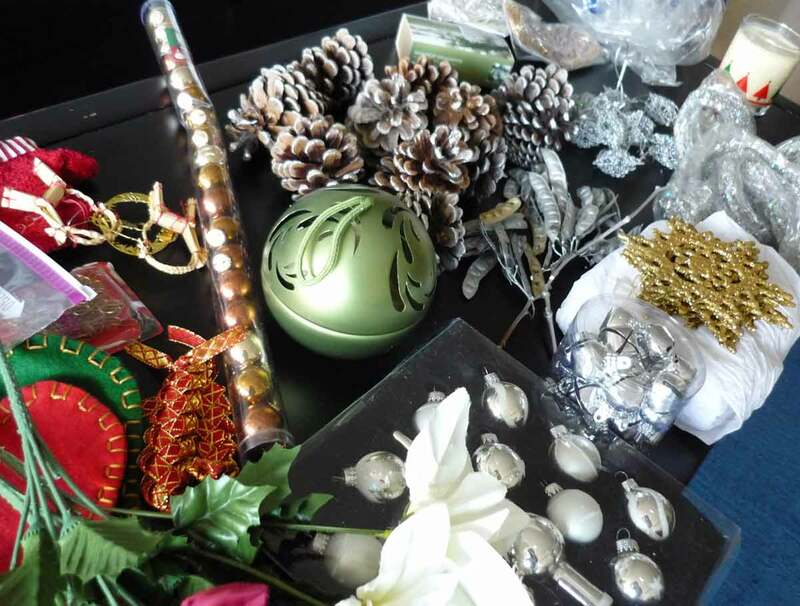 This year, we figured 12 days before Christmas was a good time – not too soon, but early enough so we would have time to enjoy the festive atmosphere. 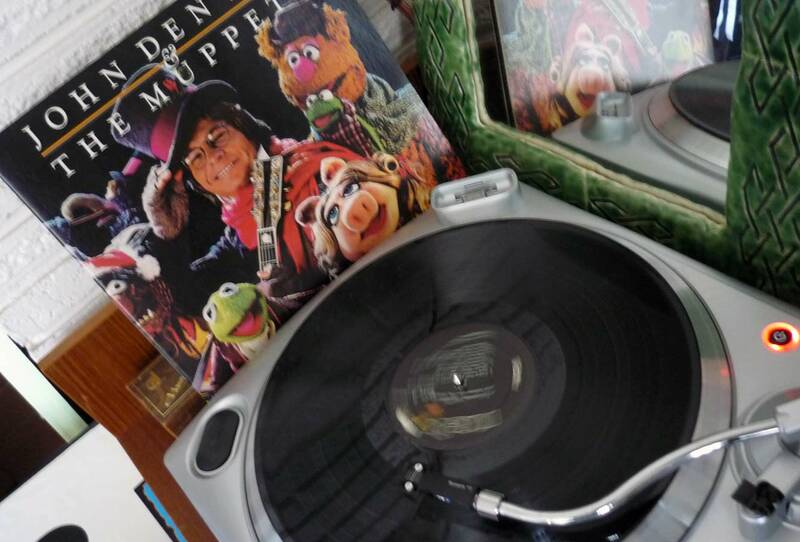 I finally got to break out the John Denver & The Muppets record that I found in perfect condition at Goodwill back in November! And of course, eggnog was had. We decked the fireplace with faux evergreen garland, sparkling pears & apples, and silvery pinecones. Our Norfolk pine tree (a year-round houseplant I bought a few years back) serves as our Christmas tree. He looks darling covered in white crystal beads, icy blue led lights, silver mini ornaments, and tinsel made of tiny silver coils. Living in Seattle, coffee is about as ubiquitous as the rain. Everyone drinks coffee (well, ok, I know of a few exceptions, and more power to them). Now, I’m not a coffee addict. I could just as easily drink decaf as the regular stuff. But I do have a major fondness for the latte. It is my coffeehouse drink of choice, and I always feel it’s a luxury to have one (it doesn’t even need to be a flavored one). That rich foam, the intensity of the espresso…. But! A daily latte fix can be expensive, to say the least. 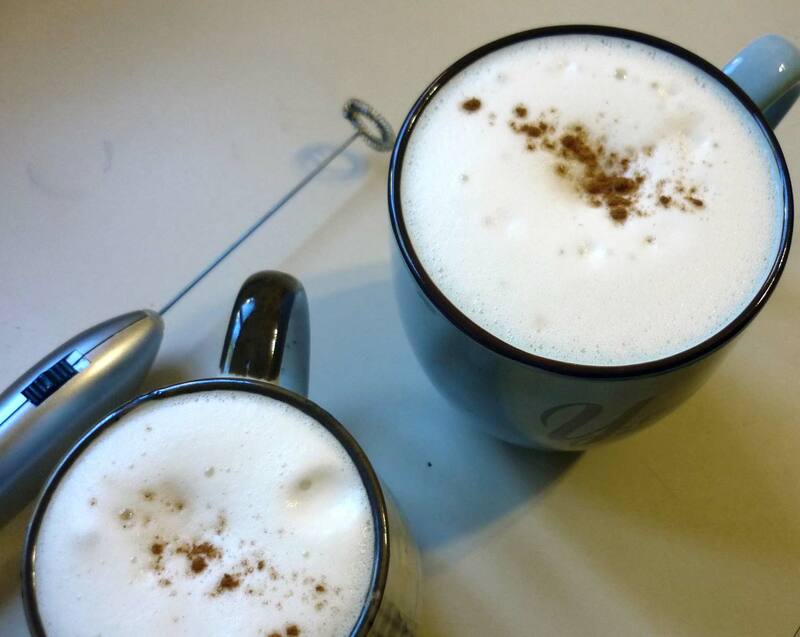 While M and I don’t own an espresso machine (…yet…) we do have a regular coffee maker, and we’ve developed a method for making faux lattes for a morning treat every once in a while. And here I’ll share the process! First we brew a strong pot of coffee (not too much, since there’s only two of us). Next, into two mugs, we add about 1/4 cup of milk, half & half, or soy milk (depending on what we have around). This time, we used vanilla soy milk, yummmm. 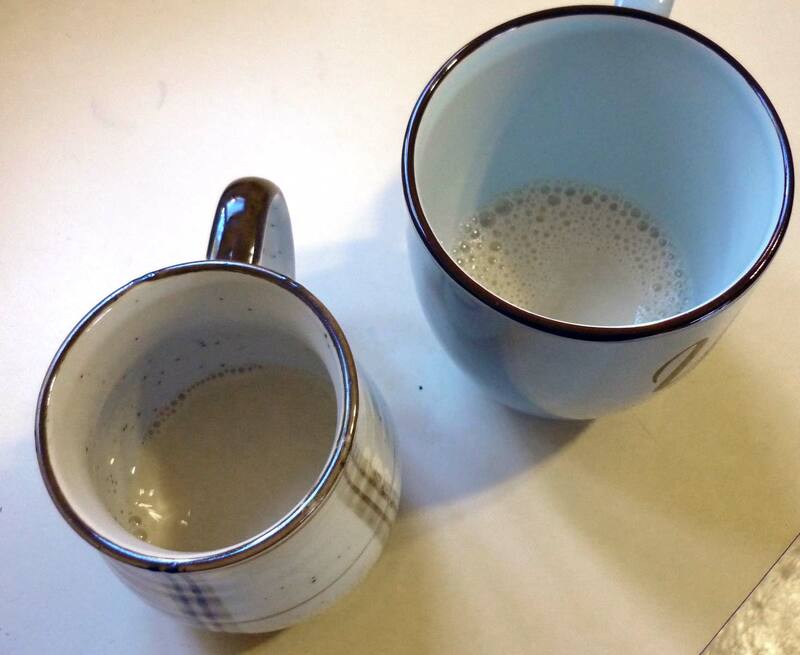 Then, (because in a real latte, the milk is steamed), we pop the mugs in the microwave for about 35-40 seconds. You can also do this in a pan on the stove if you’re adverse to the microwave. 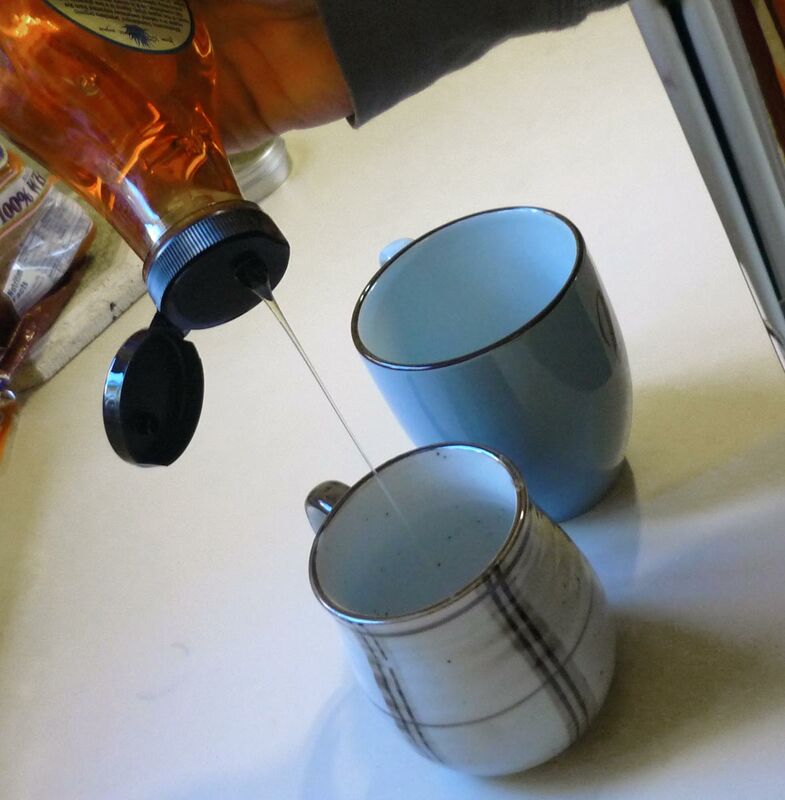 Once the milk is nice and warm, I like to add a little agave nectar to sweeten it up a bit. Agave is an excellent sweetener and so good in coffee! Now comes the most crucial element of making this pretend latte. 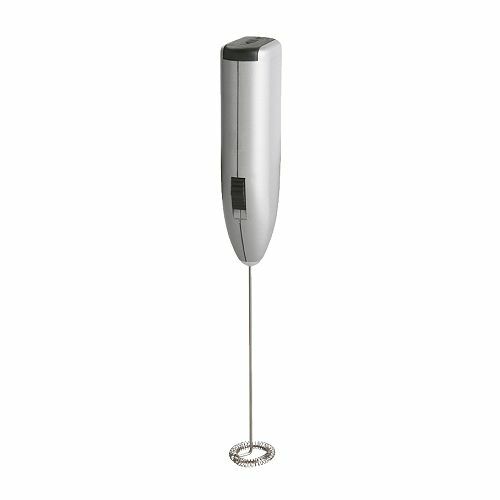 A key tool you need, is a milk frother. I bought ours ages ago at IKEA – it’s called PRODUKT, and it only cost $1.99 (and we’ve gotten so much use out of it!). 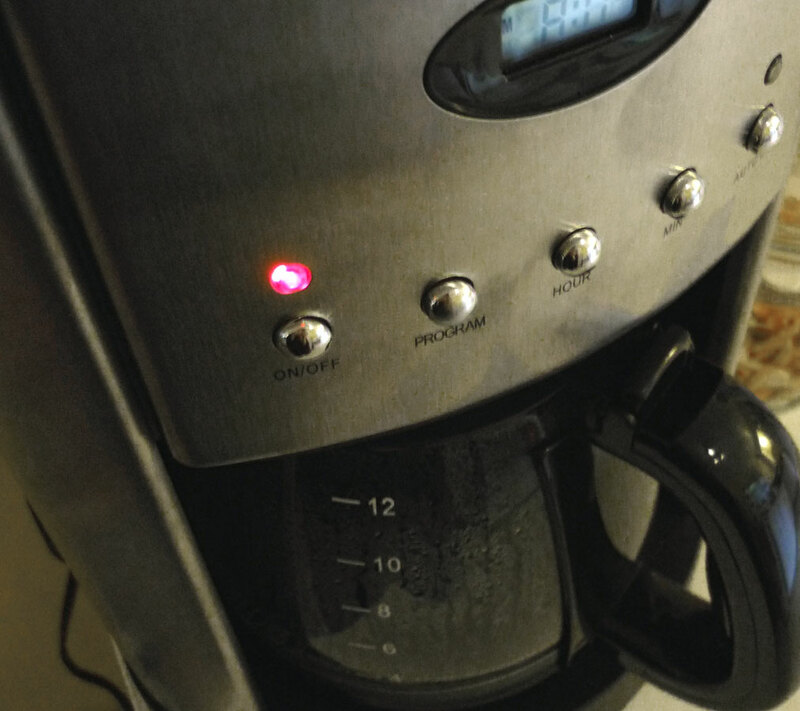 Now the fun starts…you just put the end of the frother in the milk, and turn it on! 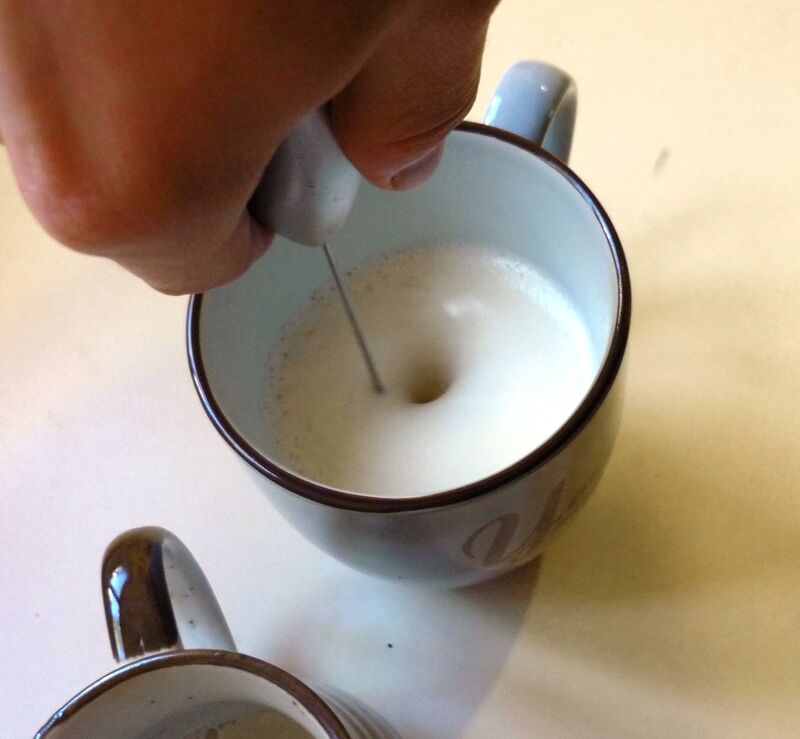 The milk starts to foam up from the vibration of the wand. 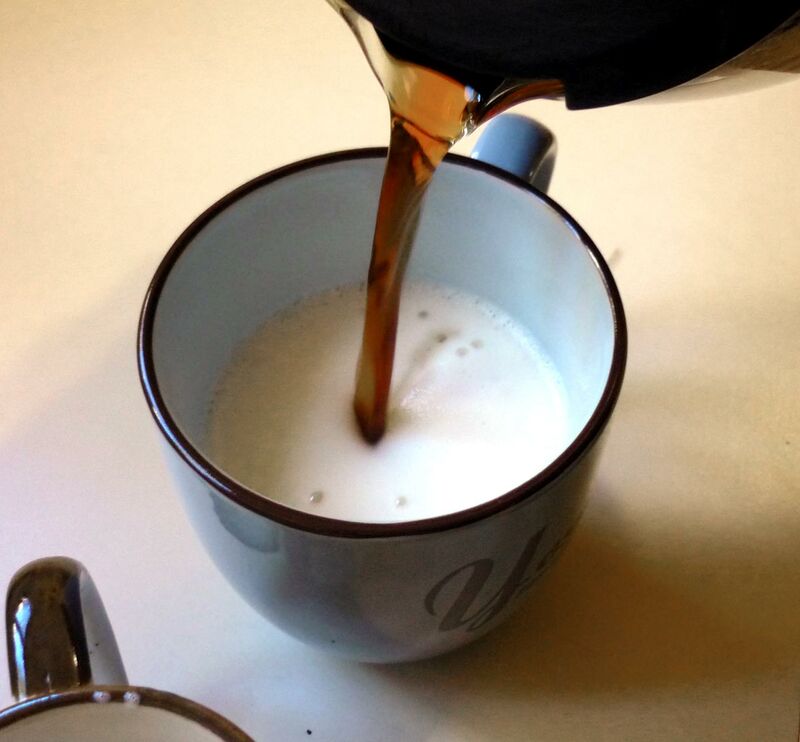 Once your milk is nice and foamy, pour in your coffee. It will cut straight through the foam.